Preheat the oven to 450 degrees F. Line rimmed baking sheet with parchment paper. In a small bowl, combine the Parmesan, bread crumbs, garlic and parsley. Season with salt, and a few turns of pepper. Toss the zucchini rounds in the oil. 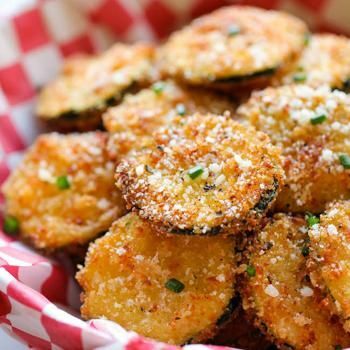 Dip the zucchini rounds into the Parmesan/ bread crumbs/ garlic/ parsley mixture, coating it evenly on both sides, pressing the coating on to stick, and place in a single layer on the prepared baking sheet. Bake the zucchini rounds until browned, 10-15 minutes. Flip the rounds and bake for an additional 10-15 minutes. Sprinkle with additional salt if desired and serve hot.